With birthdays on my mind this week as I get ready to celebrate my baby girl's 2nd birthday I thought I would share with you over the next few days some past birthday celebrations we've had for our kids. 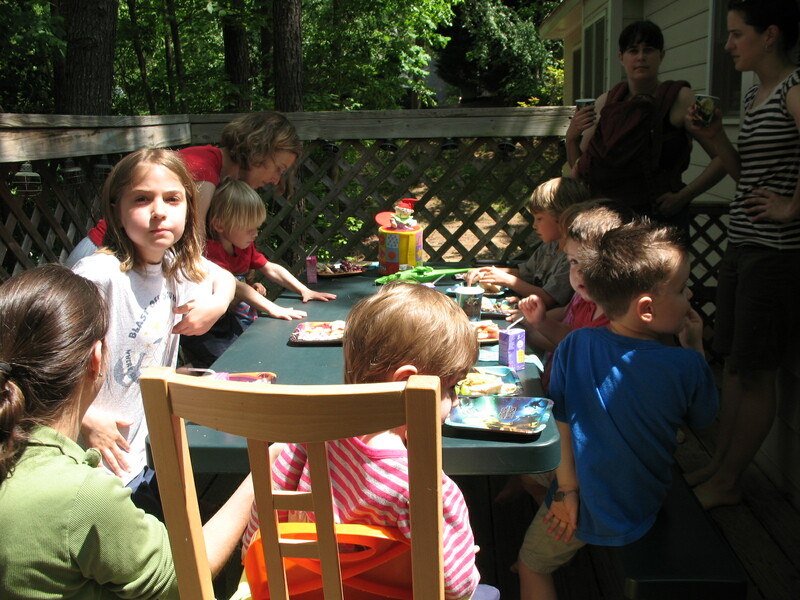 This one was for my oldest son's 4th birthday and my middle son's 1st birthday. 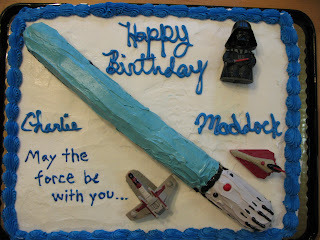 We had a Star Wars themed birthday party. My awesome husband made this invite in Photoshop and we had it printed as photographs and put magnetic strips on the back so guests could stick it on their fridges. 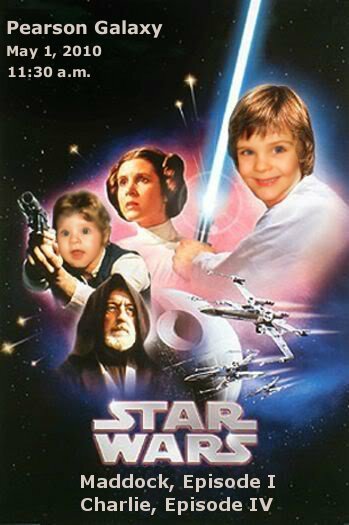 Later on we framed this for the boy's room. 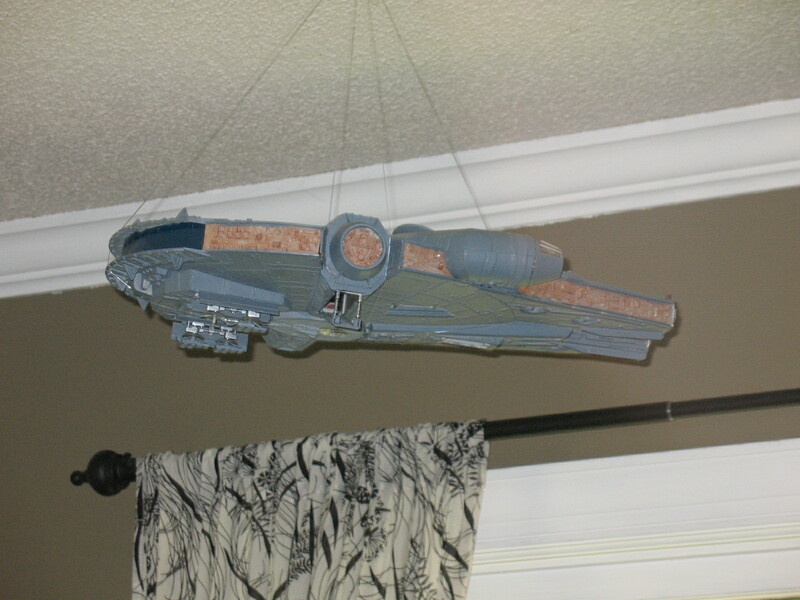 What is a Star Wars themed party without vintage memorabilia like the classic Millennium Falcon? 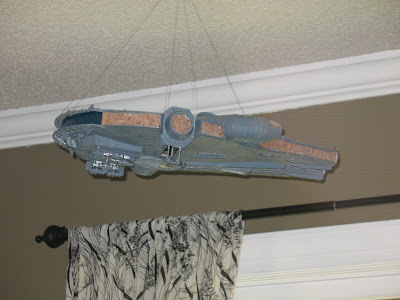 Here we strung clear jewelry thread around it and put a hook in the ceiling to hold it. 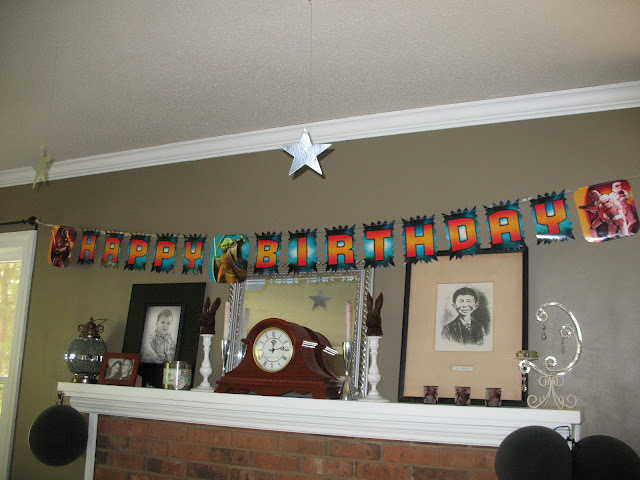 The birthday banner was from Party City. Silver stars adorned the ceiling also purchased at Party City. My son got to watch Star Wars while waiting for his friends and some of the early birds got to catch a glimpse too. It was a great way to keep the guests entertained for a bit while waiting for others to arrive. When it came to the cake, I wasn't willing to fork over $40 some odd dollars for a cake, so instead I purchased a generic white cake and made a light saber out of twinkies and added little Star Wars toys to the top of the cake. I could have made the whole thing from scratch but I was pregnant at the time with my third child and time was so precious. 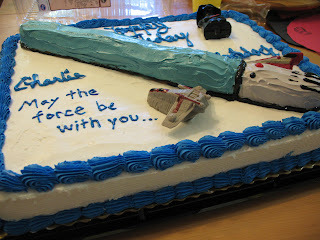 Side view of the cake with appropriate saying "May the force be with you." 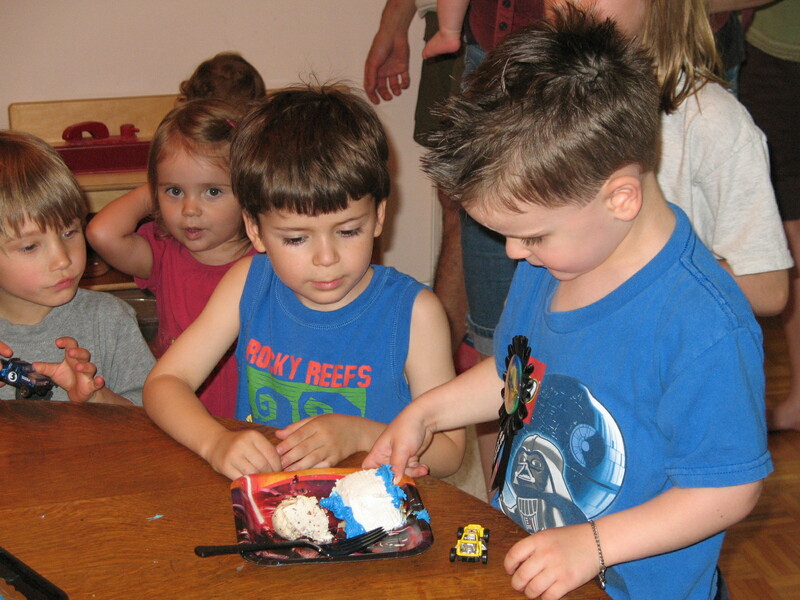 My oldest son getting the first piece of cake. As part of lunch, I made little star sandwiches out of white bread using star cookie cutters and P.B.&J. 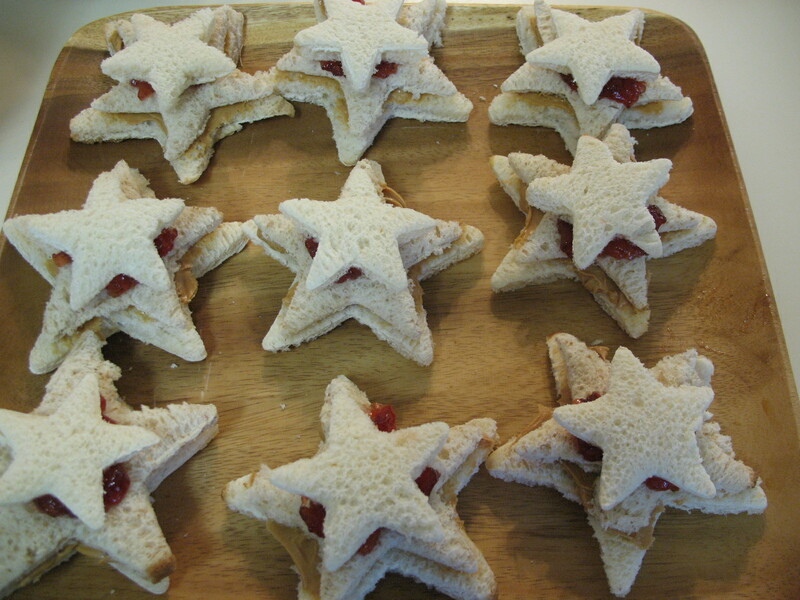 We also served Star sandwiches using cream cheese and pineapple. For the kiddos we also found Star wars gummy snacks, grapes and Yoda punch. 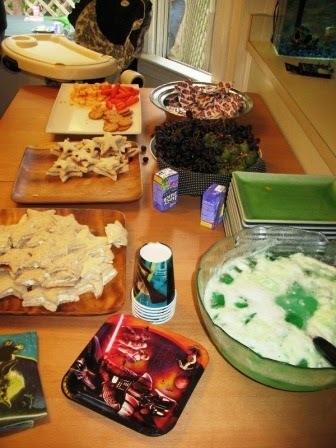 The yoda punch was made with gingerale, lime soda, and green sherbet. It was a hit with the kids and adults. 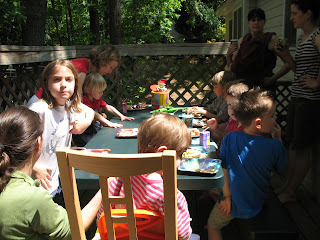 Most of the kids got to sit outside on our deck and enjoy the lovely spring weather. We really lucked out when it came to some of the decorations. 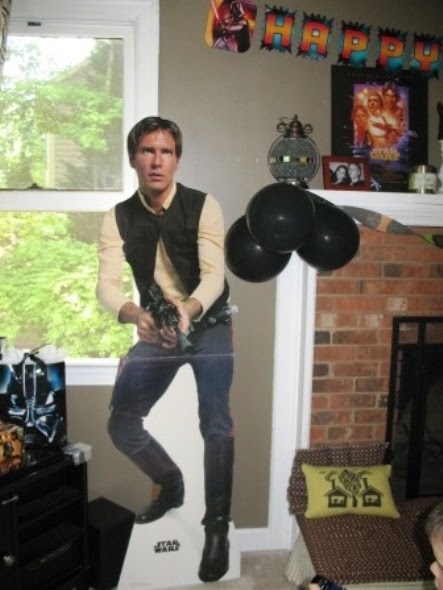 We found this Hans Solo cardboard cut out in our attic when we moved in. A relic left by previous owners. 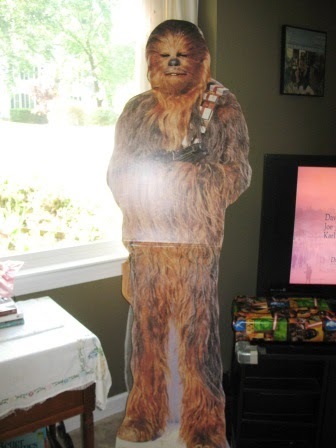 Chewbaca was in our attic too. 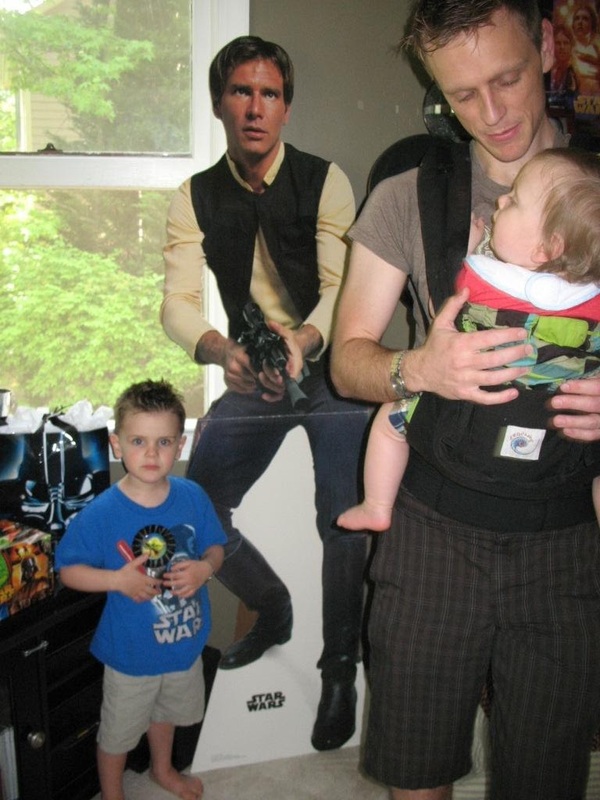 These cutouts are old! But still in excellent condition. They made great props for our guests to pose next to. Here are my little men posing in their Star Wars shirts. Maddock is in the baby Ergo so you can't see his cute red Star Wars shirt. I should have gotten a picture of them together. Whoops. Here's a small video I put together after the party. Hope this inspires you to host your next Star Wars party! 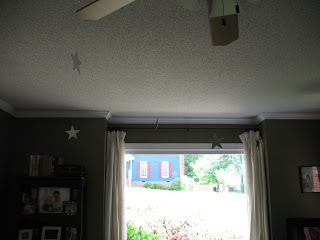 More party ideas to come! 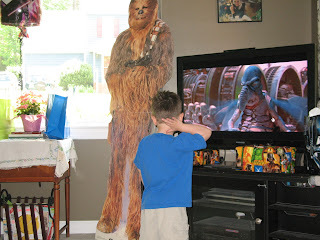 Fantastic execution...but where's the Jar Jar pinata?